In early 2018, Cinetopia launched with the first episode of our small podcast series at Radio Summerhall. In approach to the new year, we look back at what has been an exciting and productive journey – at what we have achieved in this time, and for all that is to come. Since the start of the radio show, we have come a long way. Shortly after, we began our programme of monthly film screenings at Gallery 23, as well as Q&As and masterclasses with local filmmakers like Yulia Kovanova and Stuart Edwards, networking nights, and even firm steps toward video production. From initially humble beginnings, our rate of attendance and online presence have continued to grow at an incredible pace. It seems we’re on to something. So why are we doing this? Edinburgh is now widely regarded as the home for a plethora of start-ups, creative agencies, and co-working spaces, with CodeBase and CoDesk instantly coming to mind. As the number of start-ups grows, their consistent focus on tech leaves space to consider other branches of creative and cultural “incubation”. Adding to the city’s status as a major filming location, the ramping up of film production, from organisations like Screen Scotland, marks Edinburgh as the place to be for filmmakers. In which case, this burgeoning development of our film community needs to be harnessed. With Cinetopia, we hope to provide filmmakers and enthusiasts of all stripes with the opportunity to work, create, and connect with their peers across the city and beyond. The only way to make something of the growing anticipation and enthusiasm for the Scottish film scene is to bring people together under a collective rubric of film-making and appreciation; watch, talk, make film. By providing an experience where both emerging and seasoned practitioners can come together, we hope to create the potential for future relationships and film production to blossom. Added to this, by making the confluence between film-making and the ‘film-going experience’ greater, the discussion never ends. People talking is people creating. Over the course of this year, we have built relationships to last, including with Paul Bruce and Carys B. Evans, director and assistant director of the Edinburgh Short Film Festival; Jim Ross, managing editor of Take One Magazine; and the good folks over at Leith Theatre and Scalarama Edinburgh. Each, and many more, have been instrumental in building our base and we look forward to working with them for our continuing schedule of podcasts and curated film screenings. So let us introduce you to the team as it currently stands. We have our Executive Director, Amanda Rogers, whose ideas and work have kick-started and led this exciting new venture; Michael Forbes, our Designer and Business Director; Anni Asikainen, Development Officer and Programmer; and Luka Vukos, Copywriter and Workshop Coordinator. When we’re not doing this, you’ll usually find each of us with a camera to our eye, or our eyes on the silver screen. And so, with a year of events organisation, group brainstorming and field research behind us, we can’t wait to bring a new batch of segments to our existing schedule. In the works is a reformat of the podcast series where we’ll continue to talk about the latest film news on both a local and global level. In addition, our film screenings are planned to be supplemented by a monthly focus on documentaries and further post-screening discussions. Finally, our ethos of bringing film practitioners into the mix will be fostered by our new professional training workshops and masterclasses, led by local and international experts in the field. Expertise shared is expertise gained, and a hands-on approach with successful filmmakers will no doubt foster a constructive experience for all. In a landscape where the film production bug has bit, filmmakers with ambition and creativity need to be guided towards making the most of it. So that’s us. 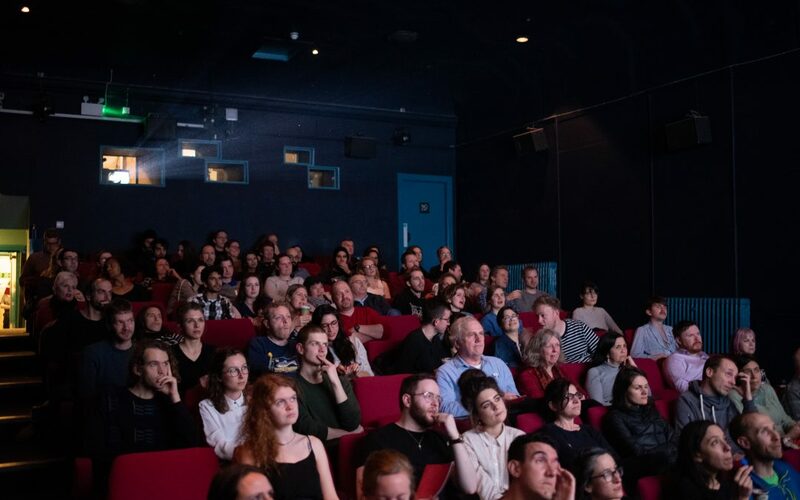 Cinetopia – a place where the Edinburgh-based film community can WORK, CREATE, and CONNECT.